Rembrandt's "Aristotle contemplating a bust of Homer"
I love using a mostly historical approach to teaching the first part of introductory astronomy. To me, it seems the most logical way to organize the class. We as a class can talk about what in the universe can be observed with the naked eye, and what we can learn from those observations. We can talk about the progression of scientific understanding and the process by which science works as we follow the chronology of astronomical achievements. I like giving examples from ancient Greece. There are the Greek astronomers Aristarchus and Eratosthenes, which are credited as the first to make (relatively) successful measurements of celestial object. But, I like to start our discussion of the origin of modern scientific thinking and processes by discussing Aristotle and Hesiod. I am not a historian, so I don't claim to be an expert on Aristotle or any of the Greek poets. Nor do I claim to be an expert of art or art history. But, I like sharing the image of Rembrandt's portrait of Aristotle, which is now at the Museum of Metropolitan Art in New York City. I first stumbled onto the painting when I was looking for images of Aristotle years ago, trying to put together slides for class. "Rembrandt had one foreign patron, a Sicilian nobleman, who asked him to paint a philosopher. The request came at a time when Rembrandt had become embroiled in serious financial trouble, and this commission seems to have sparked off some deep inner response. The combination of his personal anxieties and the idea of philosophy drew from Rembrandt one of his greatest masterpieces, in which he contrasts two ways of being a genius. "He ponders visually the importance in life of material success, fame, and power, compared with being true to art. He does so by confronting the greatest Greek philosopher, Aristotle, with the greatest Greek poet, Homer. In the 4th century B.C., philosophy included the whole of science, and Aristotle understood it, integrated and systemized it. He was dazzlingly successful. We see his rich, wide, silken sleeves - those of a man who does not need to work - and, above all, his thick gold chain. The chain was a gift from Aristotle's most prestigious pupil, Alexander the Great, who had left Aristotle an enormous fortune, but whom the philosopher had failed to influence spiritually. 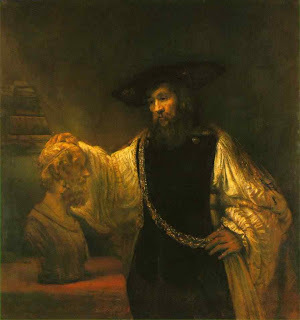 "Rembrandt imagines Aristotle in all his fame and wealth, looking at a bust of the great blind poet Homer. From the meagerness of the bust, we can see that Homer was poor. He wandered around Greece with his harp, playing at evening parties, and earning a pittance. Homer was true to his genius: he made no money from his art, and he did not care. With the medallion, representing both his great material success and his great teaching failure, swinging between them, Aristotle ponders - and Rembrandt with him: What matters most? How can one be certain that one is not selling out? Of course, I can say nothing about Aristotle, but I am certain that Rembrandt never sold out. Perhaps it was precisely these moments of profound self-questioning that kept him pure." To me, it is an interesting juxtaposition of the portrait of the great thinker and teacher Aristotle looking at the portrait (in the form of a bust) of the poet Homer. Homer lived three centuries prior to Aristotle, and although there is little or no evidence that Homer was scientifically inclined there is a connection (in my mind) between Homer and astronomy. The connection is through another poet by the name Hesiod. Hesiod probably did not live at the same time as Homer, but the writings of these poets are generally considered to be the earliest known writings of ancient Greece. Homer and Hesiod wrote down stories that were traditionally transmitted orally. Hesiod's piece "Works and Days" contains the earliest know reference to the star Sirius. Additionally, there are many other references in other ancient writings to a work by Hesiod known as "Astronomy" which contains the legend of Orion, although that work itself has been lost. Thus Hesiod is (in my mind) the world's first science writer. (He'd be a blogger if he lived today.) He did not do science, but he wrote down what the current understanding (such as it was) of the cosmos was during his lifetime. Aristotle, a great teacher and thinker, is one of the first scientists to try to use observation to draw conclusions of the workings of the universe. He didn't get everything right, but he did set science on its course.